Pressing the key before the song has been playing for 1 seconds will start the previous song. 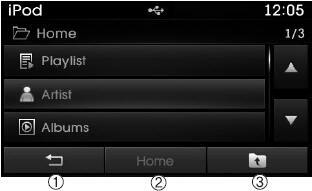 Within the iPod® Category menu, you will have access to the , Home, and features. If the search mode is accessed while playing a song, the most recently searched category is displayed. Search steps upon initial connection may differ depending on the type of iPod® device.